Concentric's German hydraulics plant in Hof, Bavaria traces its origins to the Reichert Company founded in Berlin in 1886. It currently has over 170 employees and 100,000 square feet of manufacturing space. Primary products manufactured in Hof include external gear pumps and fluid motors. Approved to ISO 9001:2008, SO/TS 16949: 2002, ISO 14001 and BS-OHSAS-18001:2007, the plant is equipped to the highest standards in CNC machining, grinding, precision gear cutting, assembly and test. The Hof facility houses applications, product engineering, customer and product service for gear pumps and gear motors. Much of the pioneering development work in low noise gear product technology has emanated from Hof's engineering department and has been implemented on Concentric branded pump designs worldwide. Hof works closely with the European marketing and sales organization and its global counterparts to ensure total customer satisfaction. 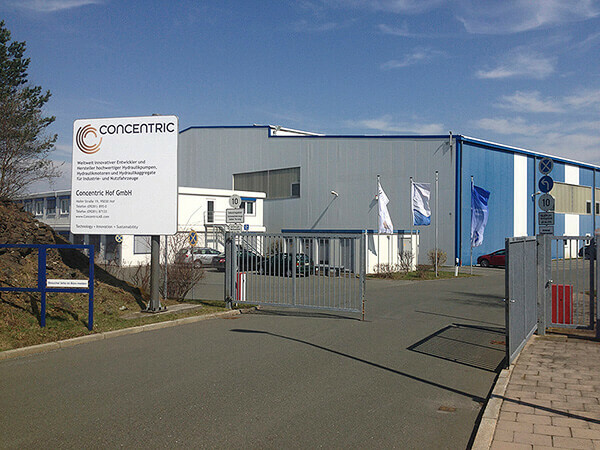 Concentric also has a German-based sales and support office for diesel engine pump products, operating in all the German-speaking countries of Europe as well as Scandinavia. Besides being responsible for all sales activities in the region, it offers customers local support in technical, logistics and quality issues. Concentric Hof GmbH, Hofer Str. 19, 95030 Hof, Germany.